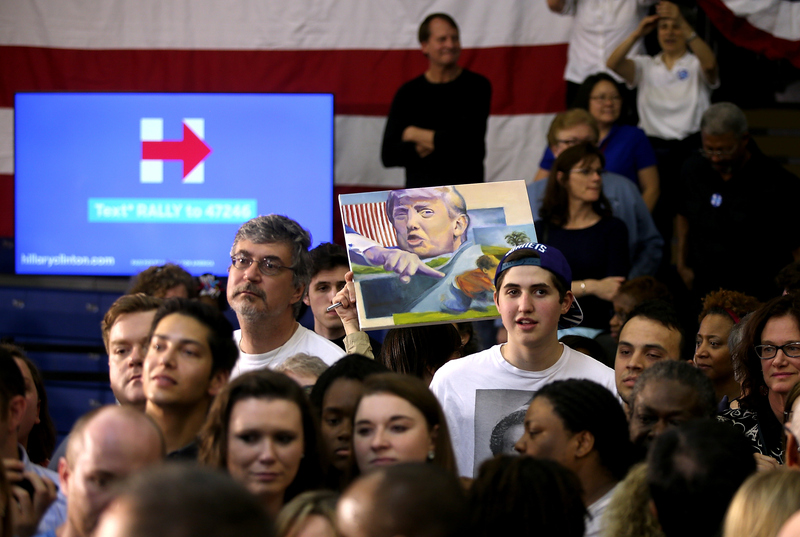 Following losses in Wisconsin on Tuesday night both Hillary Clinton and Donald Trump responded to the defeats — as politicians are wont to do when they encounter a setback mid-campaign. You can tell a lot about a person by the way they handle a loss, and it's arguably even more telling of their character (just a guess here) when it's a loss in the race for the highest elected office in the country. Trump's and Clinton's concession messages proved there really are two kinds of people in this world: Sore losers and graceful losers. More specifically, there are people who offer a gracious message of congratulations and promise to keep moving ahead, and then there are over-grown toddlers who accuse their opponent of both cheating and committing federal crimes. Guess which candidate was which? Donald J. Trump withstood the onslaught of the establishment yet again. Lyin' Ted Cruz had the Governor of Wisconsin, many conservative talk radio show hosts, and the entire party apparatus behind him. Not only was he propelled by the anti-Trump Super PAC's spending countless millions of dollars on false advertising against Mr. Trump, but he was coordinating with his own Super PAC's (which is illegal) who totally control him. Ted Cruz is worse than a puppet — he is a Trojan horse, being used by the party bosses attempting to steal the nomination from Mr. Trump. We have total confidence that Mr. Trump will go on to win in New York, where he holds a substantial lead in the polls, and beyond. Mr. Trump is the only candidate who can secure the delegates needed to win the Republican nomination and ultimately defeat Hillary Clinton or whomever is the Democratic nominee, in order to Make America Great Again. Trump accusing Cruz of doing something illegal, isn't really shocking to anyone who has been following the election, as The Washington Post's Callum Borchers noted: "It's no surprise that Trump would take this route. He charged that Cruz stole a win in Iowa (he didn't) and more recently blamed the Texas senator for a super PAC ad that featured a racy photo of Trump's wife, Melania. There is no evidence that Cruz was responsible for the ad, just like there is no evidence that he illegally coordinated with any super PAC in Wisconsin." Without anything other than his disdain for his competitor, Trump was able to put out into the ether the idea that Cruz had teamed up with the Super PACs in Wisconsin — which, yes, would be illegal according to campaign law. As Borchers explained, "Many news outlets awarded a consolation prize by spreading the front-runner's unfounded accusation that Cruz cheated his way to victory by breaking the law." Then again, it's already been shown the truth is meaningless and time is a flat circle in post-Trump America. While it's clear that Trump's response to a loss would not be acceptable on even a basic peewee soccer team, it only further demonstrates how vastly far apart he and Clinton are in terms of not only civility but strategy. Clinton may have suffered a loss, but she's still carrying on — and Trump is too busy throwing a tantrum.